Announced back in June 2012, ASUS has showcased the incredibly interesting Transformer AIO again at CES, and this time has also announced its availability. For those seeing this for the first time, the Transformer AIO is a hybrid device that is totally different from those in the market: it is an 18.4-inch all-in-one with a detachable Full HD IPS touchscreen display, which turns it into a ridiculously large tablet. Interestingly, the hybrid also runs both Windows 8 and Android 4.1 Jelly Bean and is seamlessly switchable with the touch of a button. At this point, many would be wondering how an x86 and an ARM-based OS can run simultaneously. ASUS’ solution? Fit an Intel Core processor and an NVIDIA Tegra quad-core processor, of course. 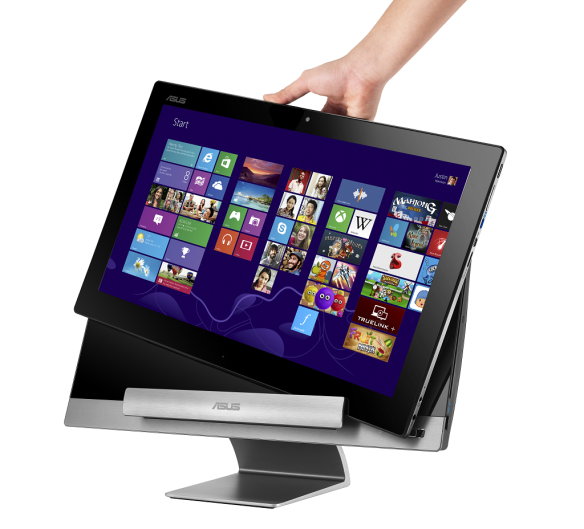 Yup, the ASUS Transformer AIO not only has two operating systems, it also has two different processors. There is also space in there for an NVIDIA GeForce GT730M GPU, although the amount of RAM and storage options were not revealed. To make it easier for users to carry this “king-size” tablet, there is an integrated handle at the back for easy transportation of the 18.4-inch tablet. The ASUS Transformer AIO will be available in Q1 this year, but prices have not been revealed. In any case, ASUS Malaysia have announced via its Facebook page that we will be seeing it here in Malaysia, though other details have not been announced.